The Club would like to thank Bart Maaswinkel (B.Sc. / B.Eng. ), Founder & Owner / Management Consultant RMI and P&I approved Yacht Surveyor at Dutch Swiss Marine, for his invaluable contribution to this article. Promptly after a ship has been secured, the Captain must at all times ensure that there is a safe means of access between the ship and quay, pontoon or another ship alongside, to enable people to access the berth or another vessel. 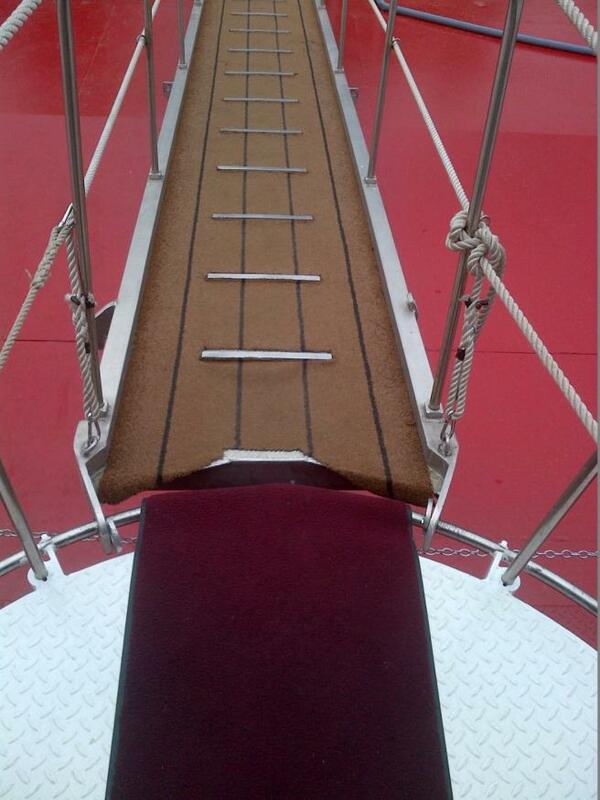 In view of their size, the majority of Members’ vessels tend to utilise gangways or passerelles for this purpose. These are favoured over accommodation ladders which tend to be constructed for larger vessels. 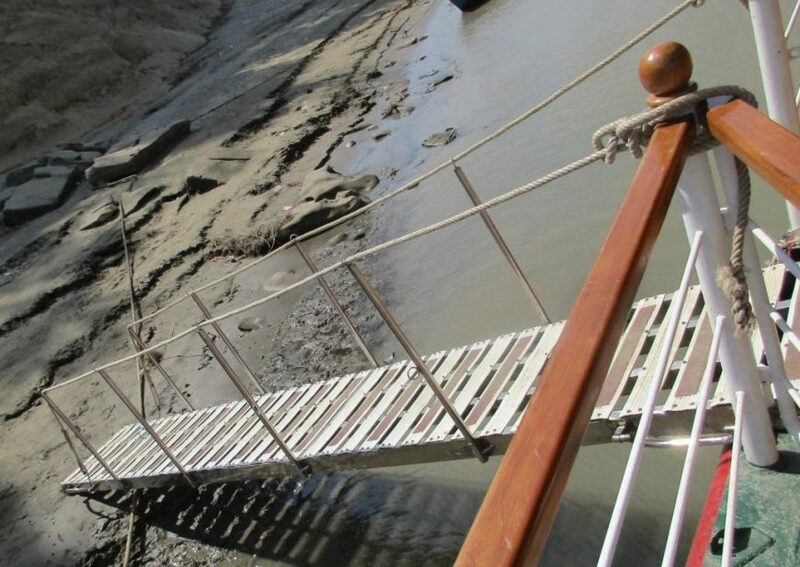 Approved gangways are normally required on ships of 30 metres in length or over, and approved accommodation ladders on ships of 120 metres in length or over. However, Members should clarify with their local regulations what is required for their specific operation. Where means of embarkation and disembarkation are fitted, other than those specifically covered by these guidelines, an equivalent level of safety should be provided. The European standard EN 14206: 2003, Inland navigation vessels – Gangways for passenger vessels. The European standard EN 526:1996, Inland navigation vessels. Gangways with a length not exceeding 8m. Where gangways, passerelles or ladders do not comply with such national or international standards, a manufacturer’s load test certificate should always be provided. Alternatively, practical tests may be carried out to the satisfaction of the Flag Administration or Classification Society. In all cases the maximum design angle, number of persons, and total weight should be clearly marked and gangways, passerelles or ladders are to be used in accordance with the manufacturer’s instructions. Side screens or handrails should be provided on both sides, along their entire length, with a minimum height of 1 metre. As far as is practical, the means of embarkation and disembarkation should be sited clear of potential hazardous areas and should not be placed where suspended loads may pass overhead. Gangways should be properly secured and, unless designed for the purpose, should never be secured to a ship’s guardrails. If positioned through an open section of a bulwark or railings, any remaining gaps should be adequately fenced. 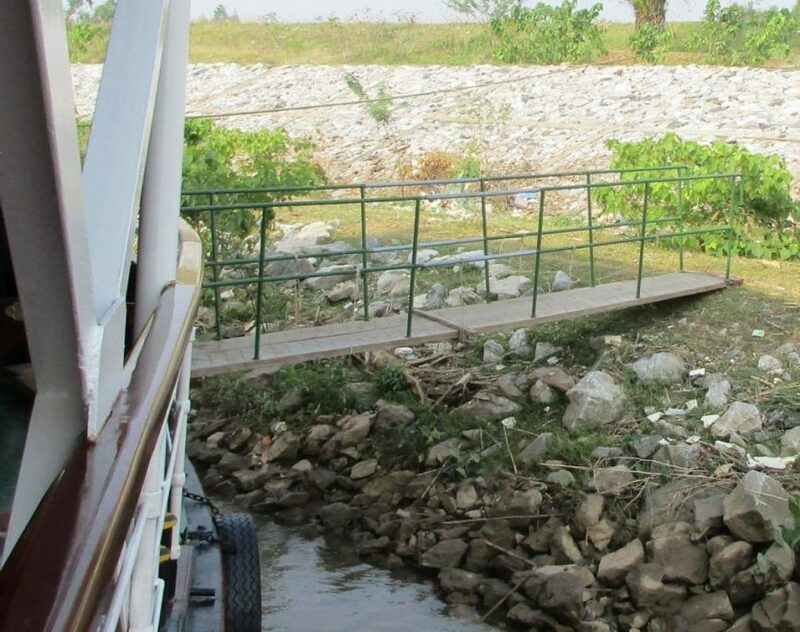 Gangways should not be placed on a bulwark or side rail of the vessel, unless they are of sufficient strength to bear the weight of the gangway and persons using it. 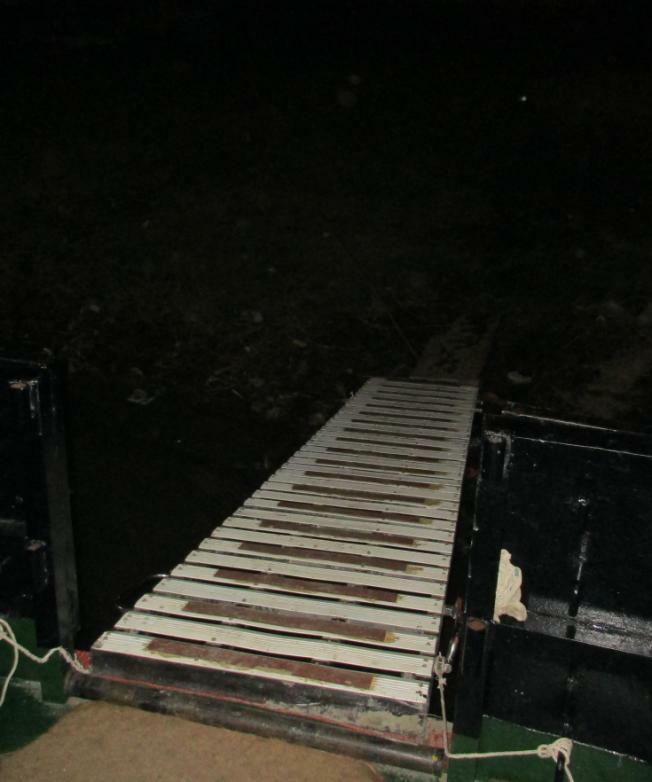 If the inboard end of a gangway rests on the top of the bulwark, a bulwark ladder should be provided. Any gap between the bulwark ladder and the gangway should be adequately fenced, to a height of at least 1 metre. Local tidal conditions should be monitored by the appropriate personnel with the use of tide tables and the position of the gangway adjusted as necessary. The angle of inclination of a gangway should be kept within the limits for which it was designed and should not be used at an angle of more than 30° from horizontal (unless specifically designed and constructed for use at greater angles). Care should be taken when several persons are standing still on the gangway (e.g. on passenger ships). The maximum capacity of the gangway should never be exceeded! Adequate lighting should be provided to illuminate the means of embarkation and disembarkation, including the positions on deck and ashore. Side edges of the gangway should be marked by a brightly- coloured strip. Gangways must be clearly marked with the manufacturer’s name, the model number, the maximum designed angle of use and the maximum safe load, by numbers of persons and by total weight. A lifebuoy, equipped with a self-igniting light and a buoyant lifeline, should be available for immediate use in the vicinity of the embarkation and disembarkation arrangement when in use. On seagoing ships, where it is possible that a person may fall from the means of embarkation and disembarkation or between the ship and quayside, a safety net should be mounted in way of the gangway. Even if it is not always required under local regulations for some ships to comply with the ISPS Code, it is good practice to have a member of the vessel’s crew permanently stationed at the gangway for safety and security purposes. A watchman is able to assist persons transiting the gangway and monitor any dangerous practices. Gangways (e.g. stanchions, hand rails, ropes or fittings) should be properly maintained and inspected at appropriate intervals as required by international or national regulations and in accordance with manufacturers’ instructions. Crew should make additional checks each time the gangway is rigged and look out for signs of distortion, cracks or corrosion. Bent stanchions should be replaced or repaired and guard ropes should be inspected for wear and renewed where necessary. Where rope handrails are fitted they should be taught at all times, with any excess slack taken up as required. Moving parts should be free to turn and should be greased as appropriate. Also, the underside of gangways should be visually inspected at regular intervals. All inspections, maintenance work and repairs of gangways should be recorded to provide an accurate maintenance history. The information to be recorded appropriately on board should include the date of the most recent inspection, the name of the person or body who carried out that inspection, and the due date for the next inspection. At every five-yearly class survey, the gangway(s) should be operationally tested with the specified maximum operational load of the gangway. To further ensure the safety of passengers, appropriate signage can be erected to notify the person boarding the gangway of any dangers or problems that may occur when transiting or alighting onto the vessel or quay. The Club has published a Passenger Safety poster an information booklet on Learning from Passenger Vessel Incidents and a series of Risk assessments for passenger vessel operations which Members’ may refer to for guidance. Is the gangway properly secured? Is the Vessel properly secured, are the mooring lines tight? Are there prevailing weather conditions, such as wind and rain? Are there high waves from passing ships with large wake? Are there gaps between gangway and ship / shore? Are there any slip, trip, bump or fall hazards when stepping on and off the gangway? Are the stanchions, hand rails, ropes etc in place and properly secured? Is there sufficient lighting available during dark hours? Are the non-slip surfaces in good condition? Does the gangway comply with the maximum recommended slope (< 30 degrees)? Is there any congestion on the gangway? Is extra assistance required for people with limited mobility? Crew members standing by the gangway should remain on duty throughout their watch and not leave their position until relieved by a fellow crew member. Responsibilities of the crew members should be included in the vessel’s safety management system and/or working procedures and be referred to as necessary. It should be noted that flag states, governing authorities and ports may differ to the advice given in this publication, but the issue of ensuring safe access onto a vessel is a combination of exercising common sense and by managing all safety risks with due diligence by the ship owner, operator and the Captain. Example A: Gangway has not been manufactured by recognised national or international standards. Example B: Gangway has not been manufactured by recognised national or international standards, is not properly secured and the slope is > 30 degrees. Example C: Gangway has not been manufactured by recognised national or international standards, is not properly secured, has no side screens or handrails provided and is not well lit. Example D: The gap between gangway and platform is a potential trip hazard.